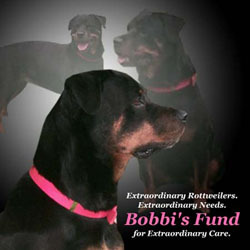 Bobbi's fund was established in January of 2003 in response to a growing need for extraordinary care for some of our rescued Rottweilers. 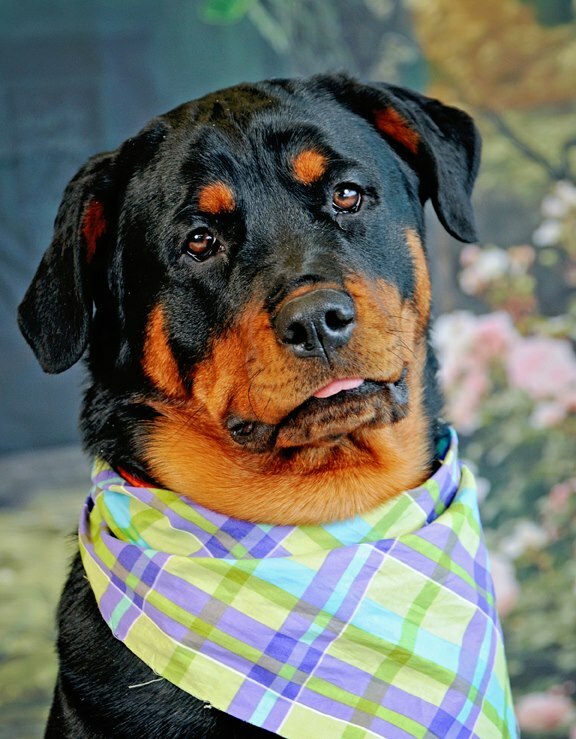 This fund is reserved for extraordinary Rottweilers who are afflicted with a physical disability or illness which will not compromise their quality of life following treatment. These exceptional dogs are often overlooked in the shelter setting because the cost of medical care places a tremendous burden on potential adopters. Bobbi was just such a dog. Tragically injured in some unknown accident, Bobbi's owner, unwilling or unable to provide for her, abandoned her. NERR&R saw Bobbi for what she was, an amazing, lovely creature with a severely crippled leg that she consistently tried to amputate on her own. Bobbi underwent several surgeries in an effort to save her leg and met up with her Guardian Angels while still undergoing treatment. Through their perseverance and Bobbi's strong will, Bobbi was given a chance to keep her leg. Success! Bobbi is doing very well, she walks daily, bosses her bothers around and gets weekly acupuncture treatments. It is for her and many more like her that NERR&R designates this fund. Tosh #1203 is the first recipient of Bobbi's fund. Portsmouth, RI 02871Please remember to write "Bobbi's Fund" on your check so it will go directly to the dogs needing extraordinary care.